When You move your blog address from Blogspot.com to a custom domain automatically your moving from HTTPS which is Hyper Text Transfer Secure protocol to HTTP which is not a secure protocol. HTTPS is a measure-nary means for ensuring that secure communication is established between a user’s browser and a web server. Any site that is HTTPS encrypted shows a green address bar or padlock in the browser window to indicate that the connection to the site is very secured. HTTPS was used by Ecommerce retailers or anyone else accepting online payments to ensure that sensitive, confidential payment details provided online were sent securely to prevent them being stolen by any malicious activities during this time of transaction. Until lately when the quest for online security of everyone has become increasingly important and Google have been at the forefront of this drive. So much so that Google announced that HTTPS is a factor in their ranking algorithm which has accelerated the switch to HTTPS. Therefore HTTPS is strongly recommended for any business who is focused on reassuring visitors to their website, securing their website, achieving a high ranking and future proofing their online operations. When you site is HTTPS encrypted, you gain More Trust and then reassures potential customers that you are a secure and responsible business website. More Transparency – Prospective customers can see that you are a genuine business and you own the domain name and ready to flow with you. Improved Conversion Rates : With HTTPS, you bring your business transaction to your far audience more likely close thereby completing a purchase or a transaction at easy if they see that your site is secured. More Traffic: HTTPS is one of the factors Google uses in Ranking sites, so then business using HTTPS can get a better ranking than less secure competitors. 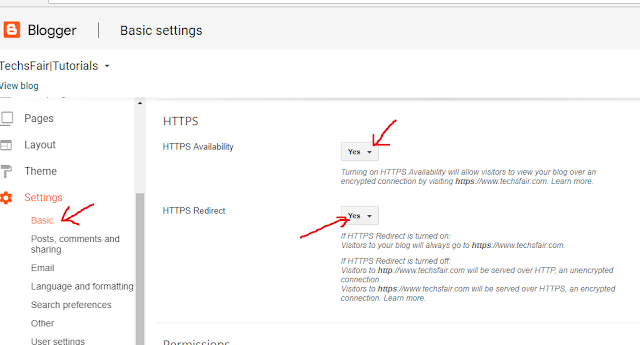 Moving from HTTP To HTTPS is For free is pretty simple and easy just follow my steps below. Step 1 from your blogger dashboard. Locate the Turn on HTTPS. Click the drop down arrow and choose yes. This simple step takes you to a secure connection.